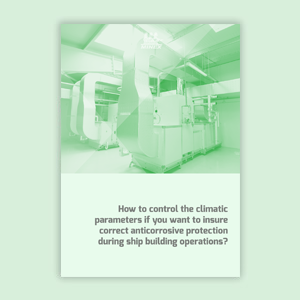 Free Whitepaper: How to control the climatic parameters if you want to insure the anticorrosive protection during ship building operations? Why is dehumidification one of the most appropriate solutions for insuring the proper working conditions in blasting and painting halls? How do the air parameters change as a consequence of the dehumidification? Which are the main criteria to be considered when choosing the optimum dehumidification solution? How to customize this technical solution to the particular needs in your shipyard?